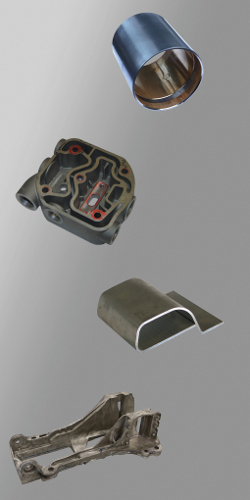 Aluminum cast parts can be deburred by means of robotic systems. Precise and defined deburring is decisive e.g. for the machining of cylinder heads as die cast parts. The deburred edges should be 0.3 to 0.5 mm (0.01″ to 0.02″) wide to guarantee a maximum size of the sealing surfaces. 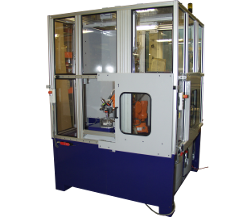 The robotic station is equipped with rotating power tools such as milling burrs and grinding pencils, grinding flap discs or brushes. 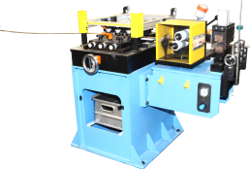 Due to edge trimming the strip is perfectly prepared for the production of plain bearing bushes and half bearing shells. Even at a speed of 100 m/min (328 ft./min) edge trimming reduces the costs. The line executes five operations: thickness and width calibration, trimming of two chamfers at the upper and the bottom side and oil grooving. 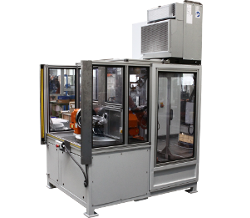 The robotic cell RSP/5F/3R machines casting parts and similar workpieces with up to five tools. Strip edge trimming machine working with one tool each side. It’s designed for the deburring of the strip edge or for simple contours at the strip edge. The strip edge trimming machine of the series DUO works with 6 tools. 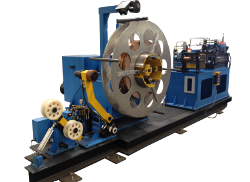 Often the DUO is integrated into tube production lines to optimize the weld seam. 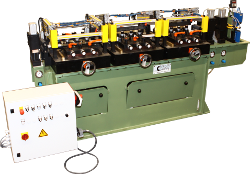 The TRIO strip edge trimming machine works with up to 9 tools achieving even complex contours at the strip edge. 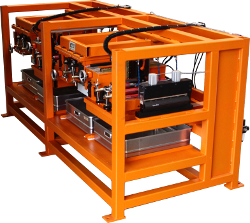 The QUATTRO strip edge trimming machine is one of the biggest strip edging machines in the modular system of JULIUS. It achieves any contour required with 12 tools. 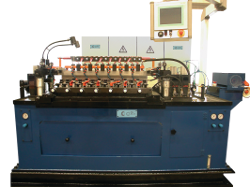 The QUINTO strip edge trimming machine is one of the biggest strip edging machines of the modular series working with 15 tools. The BKB/Kompakt is designed for maximum material removal at each tool, which ensures that even complex contours with wide bevels can be machined on strip with heavy cross sections or hard material. 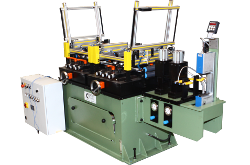 The strip edge trimming line of the series BHR/DUO is equipped with a DUO strip edge trimming machine, de- and a re-coiler. It is the basic line of the modular series. 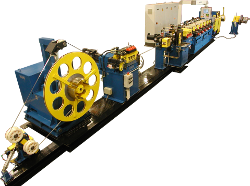 Strip edge trimming line with a TRIO strip edging machine, a de- and a re-coiler and a strip width measuring system. 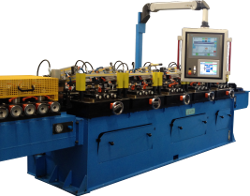 The line machines strip edges with up to nine tools. Strip edge trimming line with a strip edging machine of the serie QUATTRO, levelling, measuring and strip tension systems. The line is designed for the machining of complex contours an strip edges. Strip edge trimming line with strip edging machine of the series QUINTO, levelling, brushing and calibrating machines as well as measuring and strip tension technique. The line is designed for machining complex contours also on thick and/or smooth strips. 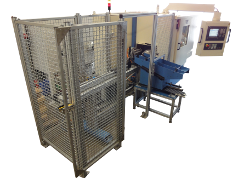 The strip edge trimming line of the series BHR/BKB/Kompakt is designed for the machining of wide and thick strips when a lot of material has to be removed at each tool. With one tool the grooving machine of the series NU removes a layer of coating from the strip surface. The tool can be adjusted vertically and horizontally. The grooving machine of the series TRINU draws up to three grooves into the strip surface with a max. distance of 10 mm (0.39") (in case of three grooves) or 20 mm (0.79") (in case of two grooves). 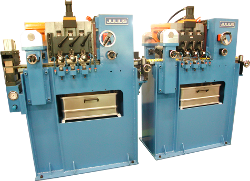 Julius offers traverse winding systems at the recoiler and the decoiler side. It is possible to run in three ways – either from coil to spool, or from multicoil to spool or from spool to spool. 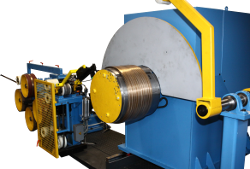 Decoilers and recoilers can be equipped with a strip tension system, a multicoil system and a traverse winding system. 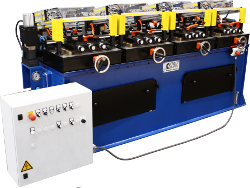 The coilers are integrated into strip processing lines. The brushing machines of the series BS remove the dirt particles from the strip surface. 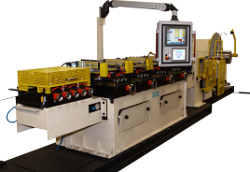 They are designed to be integrated into strip edge trimming lines. 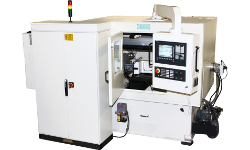 The profile generating center of the series LP130-CNC is conceived for medium and heavy-duty machining of polygons, special shapes and radial profiles.